Skiing’s place in Ulster County is attributable to the vision of two men: Alfred and Albert Smiley. While the earliest purpose-built nordic ski facility in southern New York was a ski jump for competitions, it can perhaps be argued that skiing came to southern New York out of economic necessity rather than consumer demand. Recreational skiing came to Ulster County’s Shawangunk Ridge as resort hotel operators looked for new income opportunities. 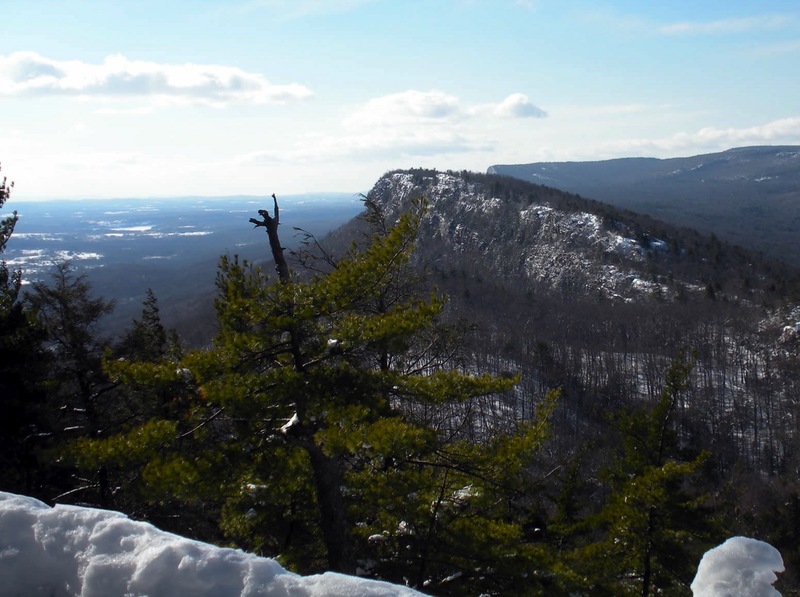 Today, two ski areas abide in close proximity to one another in the ‘Gunks: Lake Minnewaska State Park Preserve; and the combined trail system of Mohonk Preserve and Mohonk Mountain House. All are situated on land owned or originally developed by the Smileys. The Shawangunk Ridge is the northern terminus of an Appalachian ridge beginning in Virginia. In NJ, it’s known as the Kittatinny Mountains; the name changes to Shawangunks as one crosses the state line. As with the Catskills, one may posit that the ridge isn’t a true mountain range. But with altitudes ranging from 1600 to 2200 feet, that ridge holds snow just fine. The two Mohonks and Lake Minnewaska all share common ancestry. In 1869, Albert Smiley purchased 310 acres of land surrounding Lake Mohonk, just 82 miles north of New York City. A year later, he and his twin brother Alfred began offering lodging in the former Stokes Tavern. As Quakers, they prohibited card playing, drinking alcohol and dancing. Promoting the area’s unique scenery was an integral component of their marketing. In 1879, the Smileys began building the rambling, iconic landmark hotel that now sits at the edge of Lake Mohonk. On a balmy day in October 1875, the brothers took a carriage ride to what was then known as Coxen Pond, five miles west of Mohonk as the crow flies. Smitten with the pond’s beauty, Alfred purchased 2200 acres from one George Davis. The purchase price was reportedly $1.00 per acre. Davis subsequently acted as a middleman to enable owners of adjacent land to sell to Smiley. In June 1879, Smiley opened the Cliff House hotel on Coxen Pond, which he renamed Lake Minnewaska. A carriage road connected the two hotels. Over time, the Smileys developed a network of carriage roads that became the base of a later ski trail system. Guests of the two hotels enjoyed reciprocal privileges. With the success of Cliff House and Mohonk Mountain House, Alfred Smiley built a second hotel, the Wildmere, on Lake Minnewaska. In the late 19th century, city folks vacationed at resort hotels such as Mohonk Mountain House or Wildmere for weeks at a time, even for the entire summer. With meals included and all manner of recreation on site, guests had no reason to leave the grounds. They could ride a horse and buggy from the on-site livery on the carriage roads, go boating, play tennis, bowl, or stroll out to one of the many gazebos to take in the view. By the time Ken Phillips Sr. bought the Smileys’ Lake Minnewaska facilities in 1955, Americans’ leisure time pursuits were evolving. With reliable automobiles and the nascent Interstate highway system, people no longer lodged at one resort for the whole summer. Their vacations were getting shorter, and when they traveled, off-site amusements beckoned them. Fifty-seven years on, we cannot speculate on the Smileys’ reasons for selling their Minnewaska property. Did they foresee the changes in Americans’ vacation patterns, and its possible impact on their business? Or did they simply want to right-size their business? Is it possible that when Phillips purchased the property, he’d worked there so long that he developed a kind of tunnel vision regarding its future prospects? The decision to begin promoting cross-country may have been due to the influence of A. Keith and Dan Smiley, descendants of the founders. Both spent many hours in outdoor pursuits, including skiing, on their property. The cross-country experience was much different in the 1930s. Interested guests brought their skis with them to explore. There were no rentals, and guests broke trail themselves. It was a much more backcountry approach to cross-country than modern ski areas. Far end of Lake Awosting. Castle Point is the height of land in the distance; Lake Minnewaska is behind. Does 1933 mark the beginning of commercial skiing in Ulster County? It depends on the definition of commercial skiing. While it was promoted to hotel guests, it’s unclear whether a non guest could purchase a ski pass for Mohonk’s carriage roads in 1933. By this definition – day users purchasing a pass or lift ticket – the first commercial ski operation in Ulster County was the Bonticou Ski Area. This alpine slope was located on Mountain Rest Road, it was below the entrance to the Mountain House. Although located on Mohonk Mountain House property, according to Nell Boucher, two separate subcontractors managed it over the years. Started in 1964, Bonticou featured three rope tows, a T-bar, 475 feet of vertical drop and 11 acres covered by snowmaking. Sources differ as to whether a chairlift operated there: one mentions a chairlift; another says that construction began but a chairlift never operated there. The southeast exposure made it difficult to retain snow. Mohonk literature from 1971 mentions Bonticou Ski Area; it’s unknown exactly when it closed. Perhaps most important, 1963 saw the founding of the Mohonk Trust by A. Keith Smiley. Its mission was to preserve the unique ecology of the Shawangunks. The Smiley family donated 5300 acres of their land to the trust. In addition to land stewardship, the Mohonk Trust focused on environmental education. 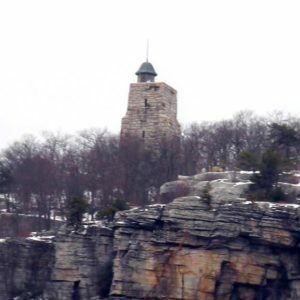 In 1978, the trust became the present-day Mohonk Preserve. Trust members had an implied access to Mountain House property that later became explicit and reciprocal. Winterizing his own hotels, Phillips opened the Ski Minne alpine center in 1965. 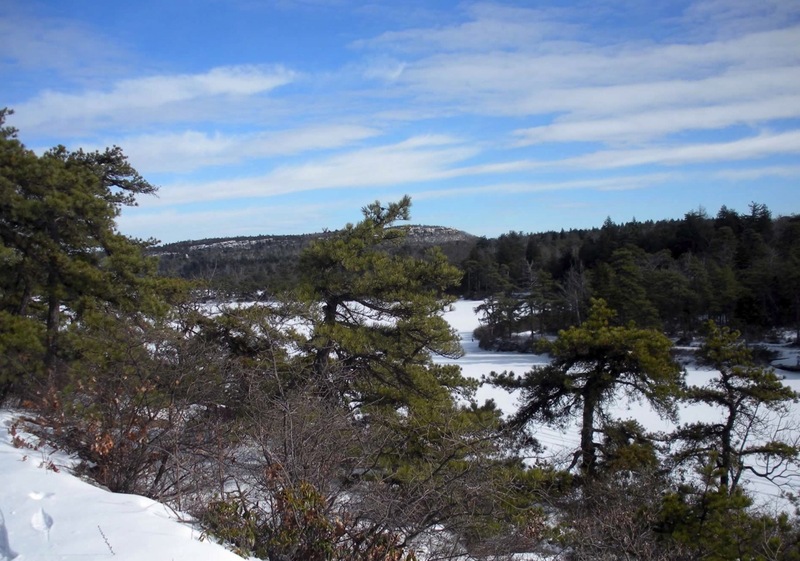 Situated in a sheltered northwest-facing bowl near the present day Lake Minnewaska State Park Preserve, it featured a T-bar, J-bar and five intermediate trails. Sixty percent of the trails had snowmaking; there was a soaring, glass-walled restaurant on the premises. Details on the success of the operation aren’t available to this writer. It’s unclear whether Ski Minne closed due to poor snow conditions or consumer preference for bigger hills with more amenities. Boucher’s 1971 pamphlet also mentions Mohonk’s 45 miles of cross-country ski trails. Around that time, Mohonk began to welcome non-guests to XC ski their trails. Boucher opined that they’d probably skied there informally for some years prior. At that time, Mohonk also began retaining a – for want of a better term – cross-country ski pro on site. He set trails old school, skiing them in himself, and doubtless gave lessons. In 1978, the Mountain House acquired its first snow machine and grooming tools. View south from Castle Point. Lake Awosting is in the distance. Today, 50 km of carriage roads offer fine, machine-groomed skiing and fabulous views. Non-guests can park at the gatehouse at the top of Mountain Rest Road, or at the Preserve’s Spring Farm trailhead. Nordic skiing’s inception at Minnewaska is unclear. One source cites 1975 as the first cross-country ski season. A pamphlet viewed online by your author was captioned as the 1972 season brochure. A promotional piece accompanying a second ski brochure referred to both Cliff House and Wildmere as being open. That is, prior to 1972. If indeed Mohonk was open to day skiers in 1971, and Minnewaska had a fee-based nordic trail system in 1971, it may call into question the claim that Vermont’s Trapp Family Lodge was the first U.S. nordic ski center. But that’s a story for another day. The gravel roads that had once hosted horse-pulled carriages were now ski trails, groomed by snowmobile. Running on the crest of the Shawangunk Ridge, the trails had been laid out to best showcase the stunning rock outcrops and flora unique to the area. On a clear day, one could see 88 miles to New York City, or across the Hudson River valley. The hardiest skiers could pack a lunch and ski out to and around Lake Awosting, a twelve-mile trek. Rustic gazebos from the resort’s heyday punctuated the trails, allowing one to rest and take in the views. While Ski Minne closed in 1977, Ken Phillips Jr. continued running a cross-country ski operation at Lake Minnewaska. He could regularly be seen either in the lodge at one end of Wildmere, or out on a snowmobile grooming the 64 km of trails. But he was perennially beset by money troubles. In 1971, the Phillips family sold almost 75% of their land to the state. Unable to afford upkeep, they closed the by-then dilapidated Cliff House in 1972; it burned down in 1978 under mysterious circumstances. Wildmere closed in 1979, the furniture auctioned off. Only a few ground floor rooms remained open as part of the ski center. Sadly, Wildmere burned down in 1986. After an acrimonious eminent domain dispute, the state bought Phillips’s remaining property in 1987. Lake Minnewaska, Lake Awosting and the surrounding land became Minnewaska State Park Preserve. While they’ve followed separate paths, today both Mohonk and Lake Minnewaska are excellent resources for local and NY metro area skiers. Mohonk Mountain House personnel groom both the hotel’s trails and Mohonk Preserve’s ski trails. While the trails won’t accommodate a full-size snow machine, the Mohonk crew does a conscientious grooming with snowmobiles. Depending on who’s telling the story, oral history varies on the quality of Minnewaska as a privately run ski area. Since the state takeover, however, trail grooming at Lake Minnewaska has been erratic. But at both facilities, people enjoy both cross-country skiing and snowshoeing in the winter. Both areas host scholastic ski races. They’re not only winter resources either: In the summer, the trails are great for trail running, hiking and mountain biking. 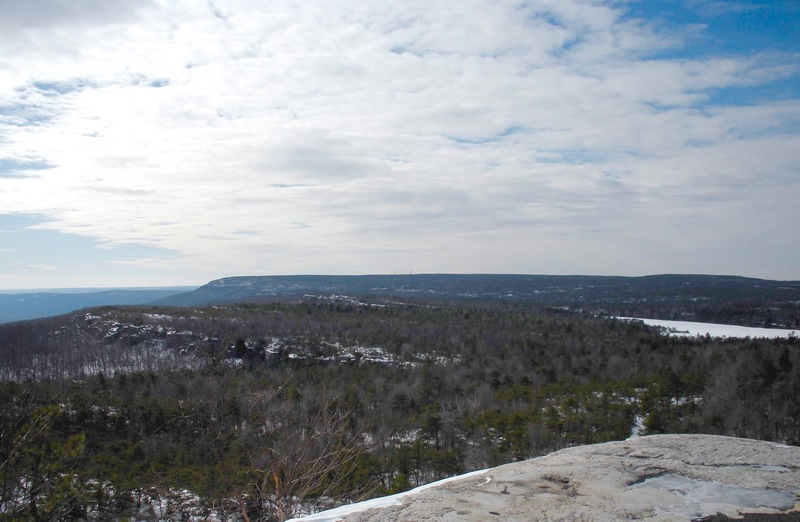 Mohonk Preserve is also home to some of the best rock climbing in the east. Today, the legacy of Alfred and Albert Smiley lives on, preserved land at Mohonk and Lake Minnewaska. 1. From the Oct 9, 2000 issue of the Daily Freeman: While purchase price and assumed debt are mentioned in the story, no public record of the sale remains. Acknowledgements: The author would like to acknowledge Nell Boucher, the archivist at Mohonk Mountain House, and www.lakeminnewaska.org. Both were invaluable sources. Additional information from Mohonk: Its People and Spirit, by Larry Burgess, 1980. I am the former Bell Captain at the Mohonk Mountain House. If you want any information, you will find everything you need in the gift shop up there. There are hundreds of history publications on sale there and everything you could ever imagine on the history of not only the MMH but also the entire Mohonk, Minnewaska and Catskill Mountains.